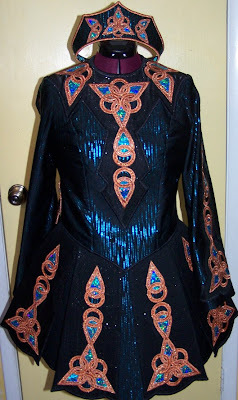 Said I would explain how I made the bodice/jacket for a 2 piece Irish dance dress using Susan’s pattern so here goes. I always make a mock-up of the bodice for fitting purposes. 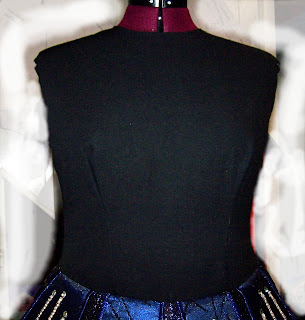 For a 2 piece, since I need a “bodice” to attach to the skirt, I use this mock-up 3 ways: for fitting, to try out the shape of the jacket hem, and then I re-adjust the hem to attach it to the skirt as the underbodice. 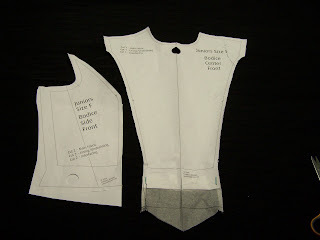 Decide which pattern size and bodice shape you need (1 piece or princess line). Make necessary alterations for fit and length. I wanted the jacket to have a dropped waist; this is easily accomplished by using the 2-inch waist seam allowance that is already on the pattern pieces as I found they flare just the right amount. Then, because I wanted the jacket to come down to a point I added more length at the center front and angled it up to the side seams. 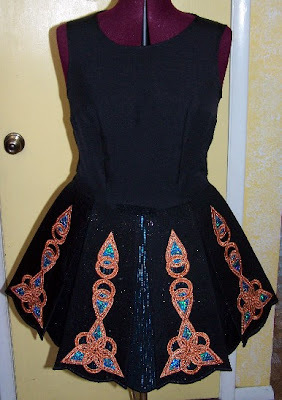 I adjusted pattern measurements to fit the dancer exactly. In fact, I made my mock-ups to fit very closely. I have read and seen that some dressmakers keep the underbodice rather loose. Saw a couple at the SRO that actually were like loose pinafores which meant attachments had to be used to keep the bodice and skirt lined up. I took a chance that making the under-bodice very fitted might eliminate the need for attachments. Turned out to be correct at least for the 4 I’ve made. 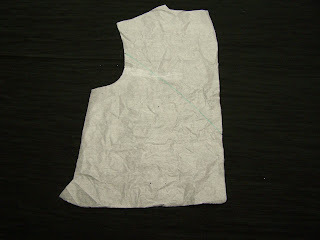 I usually make a tissue paper pattern from the Feisdress pattern. For Molly’s, I used the one piece front bodice as her mock-up/under-bodice and then transferred further changes to the princess line pattern. I attached the modified bodice hem to the Feisdress pattern piece itself in the 1st pic, and used the darted back piece tissue. I made the mock-ups initially with the waist line that I wanted for the jacket to check the shape, length, etc. I marked where the actual skirt seam would be so when I was happy with the hem shape, I cut it off and attached the skirt. These show the mock-up bodices attached to the skirts. I did not drop the waists of these skirts because I wanted them to fit snugly at the waist so there would be no swinging. The dropped waist look comes from the shape of the bodice hem and the fact that it falls below the skirt waist. 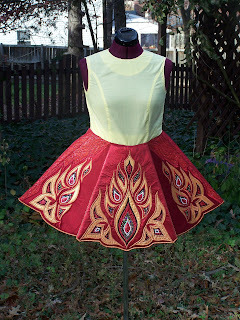 These are pics of the four dress bodice hems. 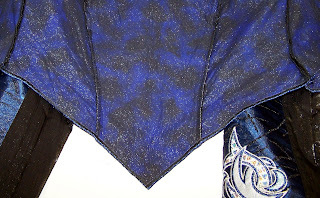 The blue one comes up a bit higher on the side (curvy dancer) but is not separated from the skirt as it looks here – the skirt is offset and you can’t see the black fabric in this pic. But you can see how snugly in fits on the red, black, and pink ones. 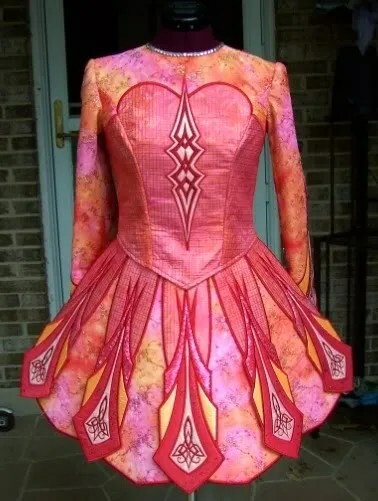 I saw a couple of 2 pieces at the SRO on which the front bodice came to a point but the front side princess bodice panels were straight across. 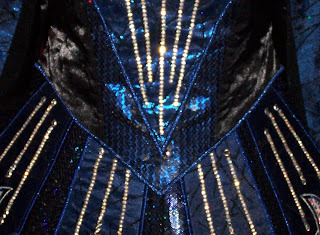 I personally do not like the look so I angle mine to blend with the center bodice. Decide how you want to stabilize the bodice. 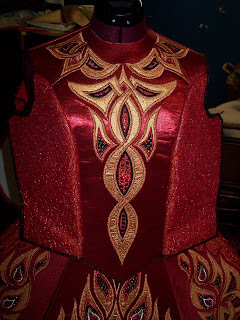 The red bodice ended up being VERY stiff – I call it the flak jacket. This happened because I first stabilized the base fabric with a woven fusible because I wanted to be sure I would not punch huge holes with my embroidery (I like a very close satin stitch), and then I added fusible decor bond each time I moved the hoop for a new section. 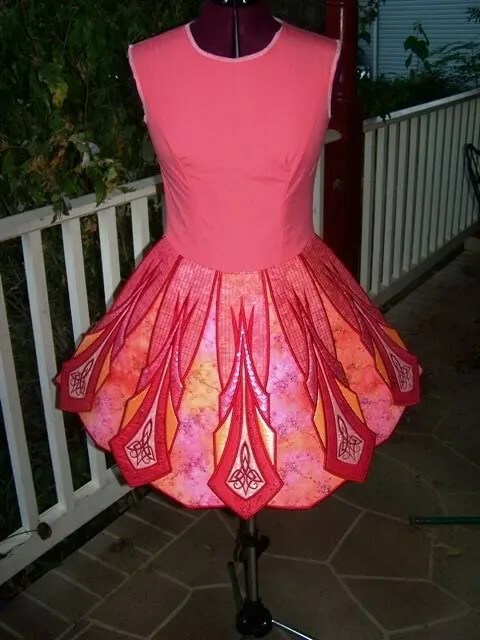 I then stiffened the front side bodice to stand up to the middle bodice and ended up with a jacket that does not crumple, and because it is very fitted, it does not shift either so I did not add attachments to keep it centered over the skirt. Time will tell if I can keep it that way. Decide on your hem finish. 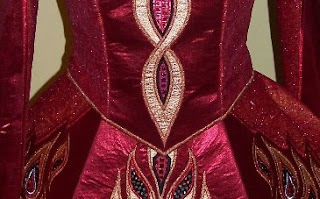 Susan and I discussed using a hem facing, but I decided to satin stitch these bodices, mainly because these dancers are not really growing anymore. And even if the 2 teenagers were get a bit taller, there is room to let the skirt down and the bodice will still cover the waist seam. I obviously used a separating zipper in the jackets. I used a regular 24″ zipper in the dresses (underbodice & skirt), though I have recently begun using long separating zippers so that the whole dress opens and like that much better. When all was said and done, Susan and I discussed using boning. The blue jacket is not as stiff at the sides as the red and black ones, and I may try adding some boning to make sure it does not crumple. Right now it is fine, but I would like it a bit more crisp looking.